Guyana’s Foreign Affairs Minister, Carl Greenidge on Tuesday indicated that his country would be paying guarded attention to the political situation in the former Netherlands Antilles- Bonaire, St. Eustatius and Saba- where residents complain that they have been recolonised eight years ago by The Netherlands. They want to be replaced on the United Nations list of non-self governing territories. 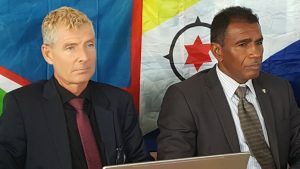 “That can only happen if that’s asked for by a member state of the United Nations and we were advised by different people to have it done preferably by the neighbouring countries, the brother and sister countries, which is formed by the Caricom,” Former St. Eustatius Island Secretary of Koert Kerkhoff. He explained that once the islands are back on the list UN member nations could ask what is happening there and whether The Netherlands would be decolonising or not. Greenidge said Guyana and the rest of the Caribbean share the same patrimony and similar experience of being brought to this part of the world forcibly. He, however, noted that Guyana has to be wary of the fact that a referendum had decided those islands’ fate. “We have an interest and we will have a watching brief but we have to be careful about constitutional rights and interference with other people’s constitutional arrangements,” he said a day after three advocates briefed the media in Georgetown following discussions with him and the Caribbean Community’s (Caricom) Assistant Secretary General for Foreign and Community Relations, Ambassador Colin Granderson. The representatives of the Nos Kier Boneiru Bek Foundation from Bonaire, Brighter Path Foundation and the “illegally deposed government of St. Eustatius” said they sought solidarity from Guyana and Caricom “in condemnation of and to expose the blatant violations of human rights, the continued colonial administration, the contempt for identity and culture of the local people by the Dutch government in The Hague and its local collaborators”. The advocates expressed concern that the daily influx of Dutch Europeans on Bonaire, Saba and St. Eustatius was putting locals out of jobs and eventually giving them the right to vote in domestic elections. “With the right to vote in local elections obtained in 90 days (a Dutch law), these Dutch immigrants could soon outnumber locals in the electorate and replace them in their representative bodies, making the exclusion of local people complete,” Nos Keir Boneiru Bek Foundation, Brighter Path Foundation and the deposed government of St. Eustatius said in a statement. Despite allegations of corruption, Kerkhoff said there has been no evidence and no one has been prosecuted. Leader of the Nos Kier Boneiru Bek Foundation, James Finies said that while Dutch Europeans could travel freely to the Bonaire, St. Eustatius and Saba, persons born on the islands could not do so to The Netherlands. He also complained about an increased death rate, disadvantaged access to education because the official teaching language has been changed from Papiamento to Dutch, increased taxation.’We cannot stop any law, we cannot object, we cannot vote them out of office, we cannot do anything so we are in that situation at that moment,” he said. The Netherlands on October 10, 2010 took over the administration of Bonaire, St. Eustatius, and Saba and declared them municipalities of the ‘mother country’.